You can market your Universal / Unique Payment Form in Facebook. 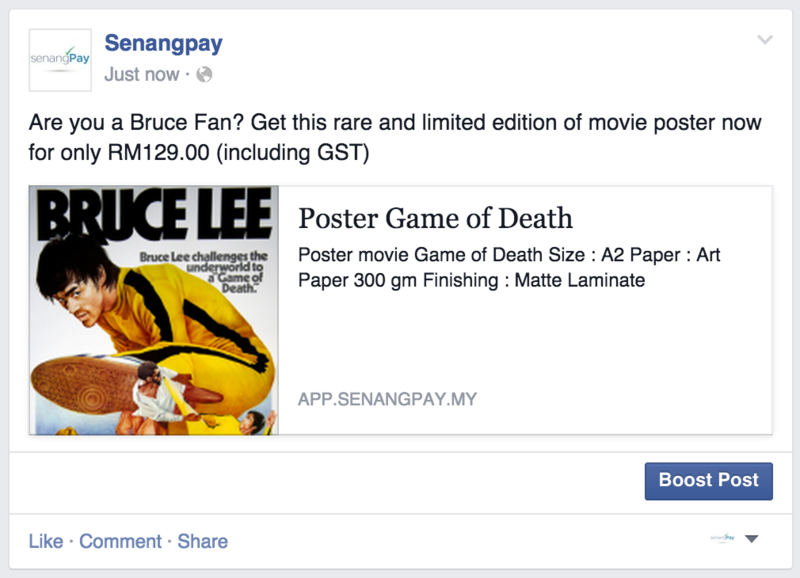 Buyer can buy directly from your Facebook Page / Profile. 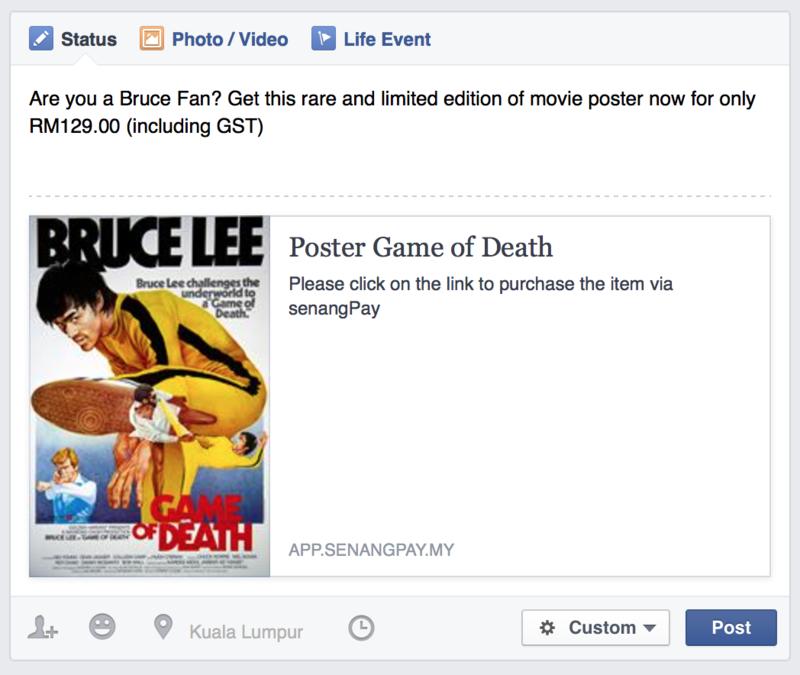 When they click the link on Facebook, it will direct the buyer to the Universal / Unique Payment Form. 1. Your business solely relies on Facebook. 2. You don’t have any blog or website for your business. 3. 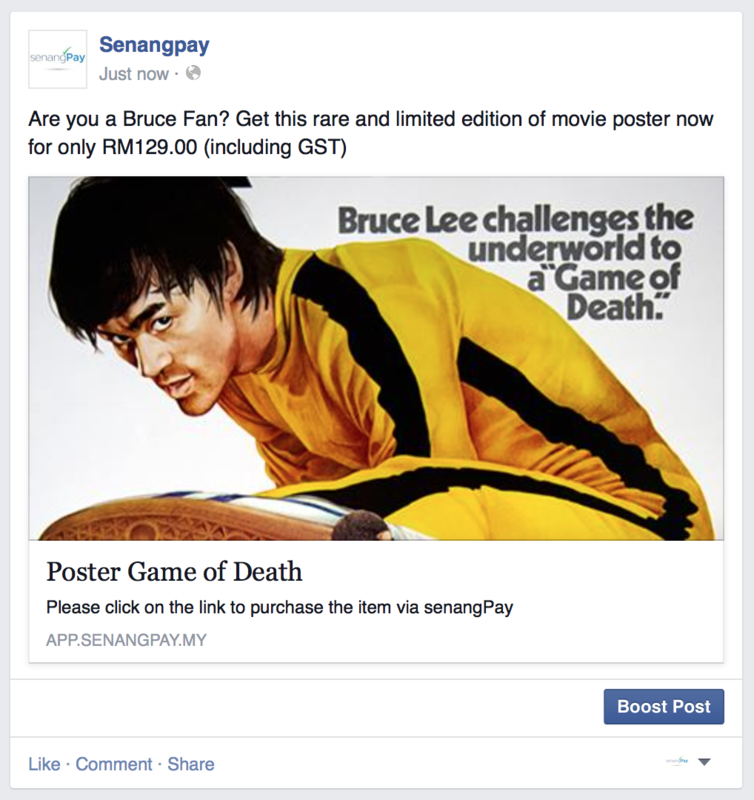 You want to sell your products or services using Facebook. 4. 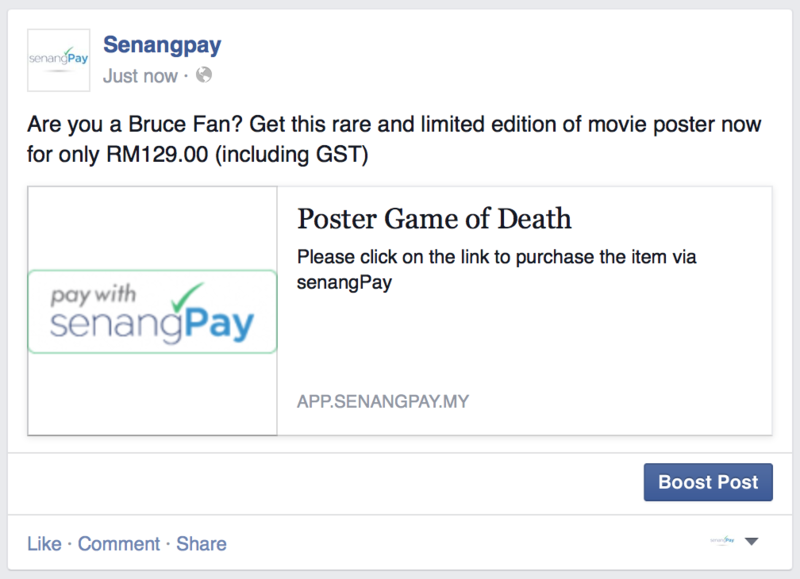 Buyer make payment from your Facebook posting through senangPay links. 1. Sending payment form links as a post on Facebook as easy as sharing a webpage links. 2. When buyer click on the Facebook post, the payment form will pop up and they can easily make payment from the payment form. 1. First, you need to get the payment form link from your senangPay Dashboard. In this tutorial, we are going to use Unique Payment Form as an example. 2. Log in to your senangPay Dashboard. 4. You should see your list of products here. 5. Click “View” to get the Unique Payment Form URL. 1. Now open your Facebook. 2. On the status bar, insert the URL that you have copied earlier. 3. Upon inserting the link, you will see 2 items.The copied text URL and the content of your products. 4. Delete the URL and refresh the web browser. Then, re-enter the URL again. This is because Facebook is unable to load image for the first time when you share the link. 5. Upon inserting the link again, you will see 2 items.The copied text URL and the content of your product along with the image. 6. Next, delete the URL and write your own marketing text including the price of your product. 7. If everything is good, click “Post.” Your post should appear like this. Please take note that, this is a sample for product without product description. 1. This is a sample for product with product description. 2. This is a sample for product with no image and no product description. 3. You can also enter your content manually into the status box. 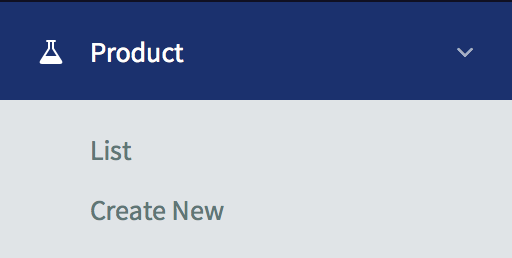 Below is the example where the Product Name, Product Description, Price and link to the Unique Payment Form are entered manually. This includes uploading the picture manually. 4. If your post appears like the post below, it means that the picture used in your product page is too big (bigger than 600 pixel x 315 pixel). Read here for more tips from Facebook. 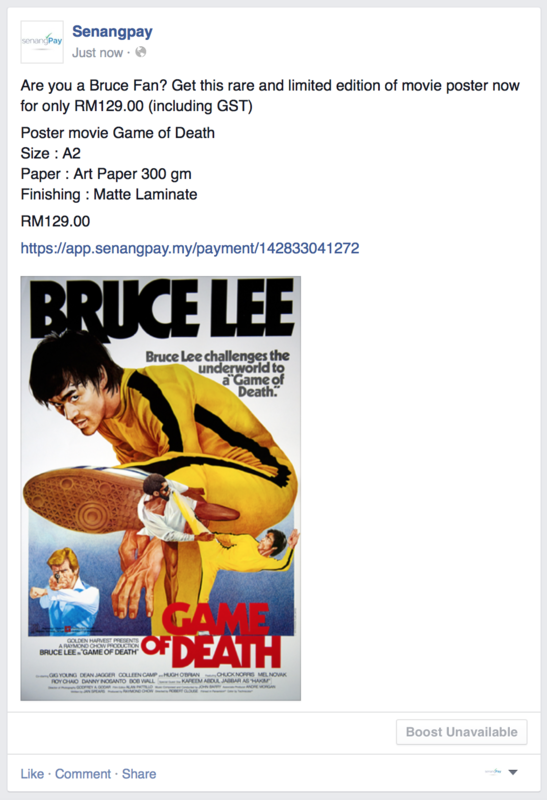 It seems that Facebook takes some time to auto reload the post content if you keep changing the picture or description from the senangPay Dashboard. 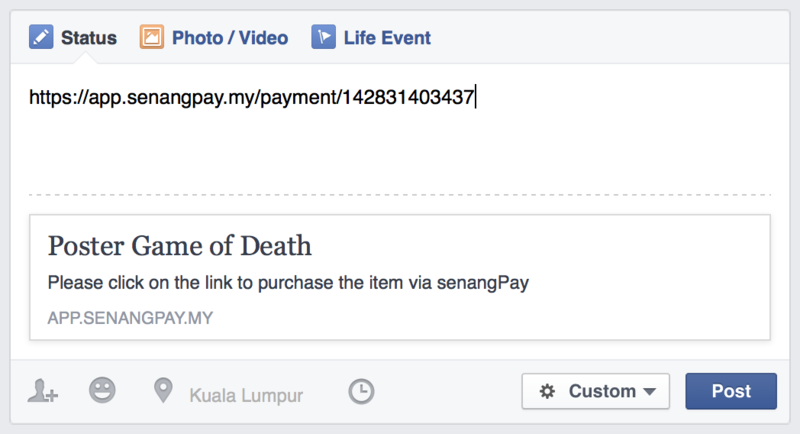 Thus, reloading your Unique Payment Form in Facebook’s developer page might help Facebook to reload your content. 6. If all of your effort still failed, we suggest you to delete your product in the senangPay Dashboard, and re-upload your product with the correct content.